Photography has a special place in my heart. I have always been interested, I have invested thousands of dollars into high-quality camera gear, and I actively attempt to get better everyday. But, when I first purchased my camera, I entirely forgot about a strap to hold it and a bag to safely and beautifully secure it. Thankfully I have the opportunity to review the Holdfast Small Roamographer Bison Camera Bag. This luxury, vintage inspired camera bag is quite stunning, and having seen other beautiful and well-built products from Holdfast, I am beyond excited to have received this camera bag. The Small Roamographer bag is handcrafted with American bison leather, with two large belted straps and a post to secure it. The small bag comes with a hefty shearling-lined strap for over the shoulder carry, with an extra lobster claw clasp to fasten a camera or extra gear. There are also double handles for hand carry. There are two large external pockets on the outside of the bag, marked with the HoldFast logo. 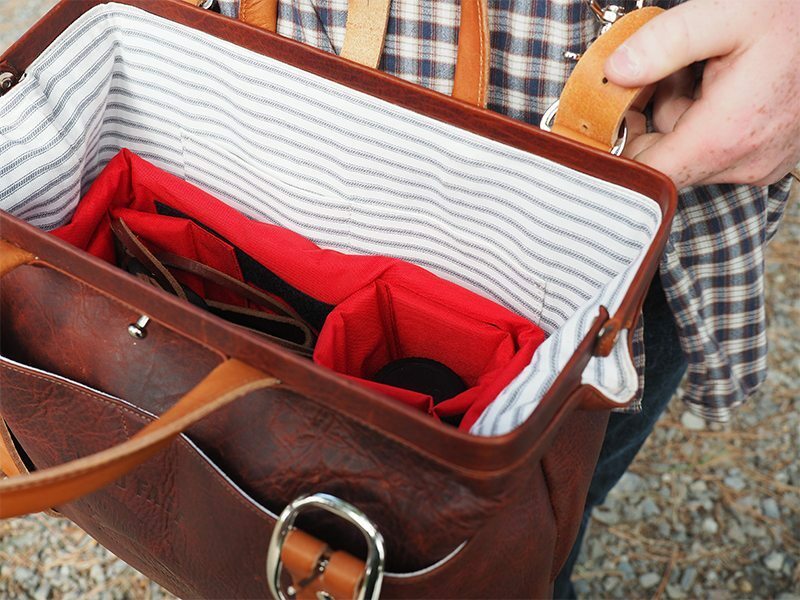 The bottom of the bag supports itself with metal studs to keep the bag stable and clean. The bag is lined with blue and white striped fabric, with 2 interior sleeve pockets. The removable red foam insert has 4 exterior pockets, 1 interior document sleeve, 1 exterior padded iPad pocket, 2 removable dividers and 1 removable dual lens sleeve. The insert is customizable to whatever configuration works best for you and your gear. 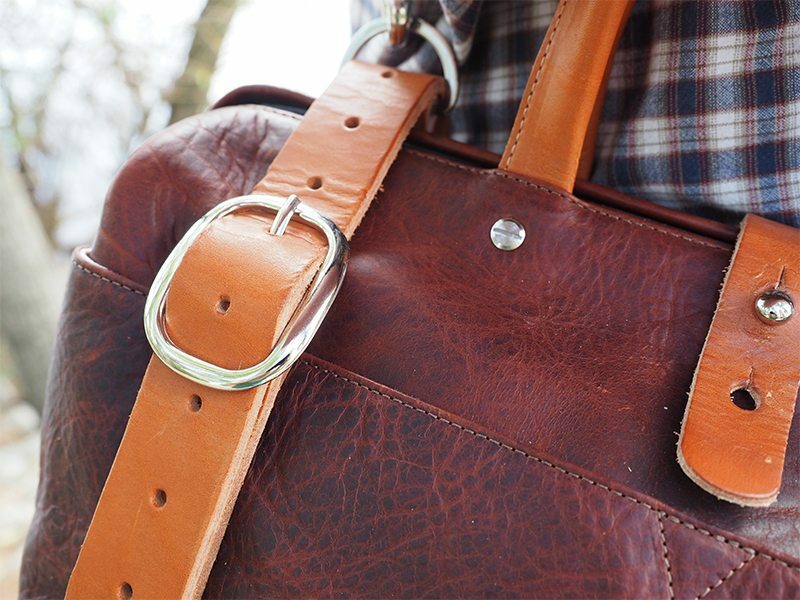 The most remarkable part of the bag’s construction is its hinged, Gladstone-style opening. This means that the bag stays open as wide as possible so you can grab your gear and swap out lenses with ease. This is really an amazing feature for on-the-go photographers. As I said, this bag works extremely well for photographers who are on-the-go. Its customizable insert, wide-mouth opening, and lobster-claw straps are all details that have obviously been thought through by people with experience hauling camera gear. The only real issue I’ve experienced with this bag is that there are a LOT of straps. To get in the bag you have to undo two heel-bar straps as well as the post latch. I’ve found myself leaving the two straps undone for most of the day if I need to get in and out often. The body straps can be secured to the back of the bag, leaving only the post latch, so that helps. This isn’t a huge issue, as the straps do keep my camera gear very safe and secure, but if you are strap-adverse, you may want to consider this. The Roamographer comes in two sizes – Small and Large. My small Roamographer bag is 14.5″ L x 9″ H x 8″ D, on the exterior, and the insert takes up 12″ L x 7″ H x 6.5″ D. The smaller bag is recommended for mirrorless and rangefinder gear. I easily fit my Olympus OM-D E-M5 Mark II, two lenses, my Go-Pro, a small tripod, and more. The larger bag measures 18″ L x 14″ H x 10″ D, and is recommended for DSLR gear. We will have a featured review of the large Roamographer coming soon. This bag comes in two body colors, black and brown, both with light brown straps. The bison leather gives it a beautiful and unique texture that’s offset with the lighter colored straps. This is a bag that gets noticed. There’s a reason the Roamographer is making a splash in photography circles – it’s unique, it’s extremely functional, and it’s constructed impeccably. The Holdfast Small Roamographer Bison Camera Bag will keep your camera (and many more after it) safe and secure, while looking incredible. The price tag is steep, but remember that this is an extremely well built bag with a number of features that you will find invaluable. 1 Comment on "Holdfast Gear Small Roamographer Review – $525"